This past Saturday I got the wee one to fall back asleep around the same time that Lily woke up. Instead of having her zonk out in front of a show I conquered my desire to sleep in and went downstairs with her to have a little mommy/daughter breakfast time. One thing led to another (an intense chocolate craving may have been involved) and we ended up whipping up a batch of homemade hot chocolate to go with our pancakes. I was so glad we did. Oh man, this stuff is delightful. Rich, thick, creamy– all those things you crave in hot chocolate but rarely get. Since Saturday I have made 3 batches. That's how good this is. 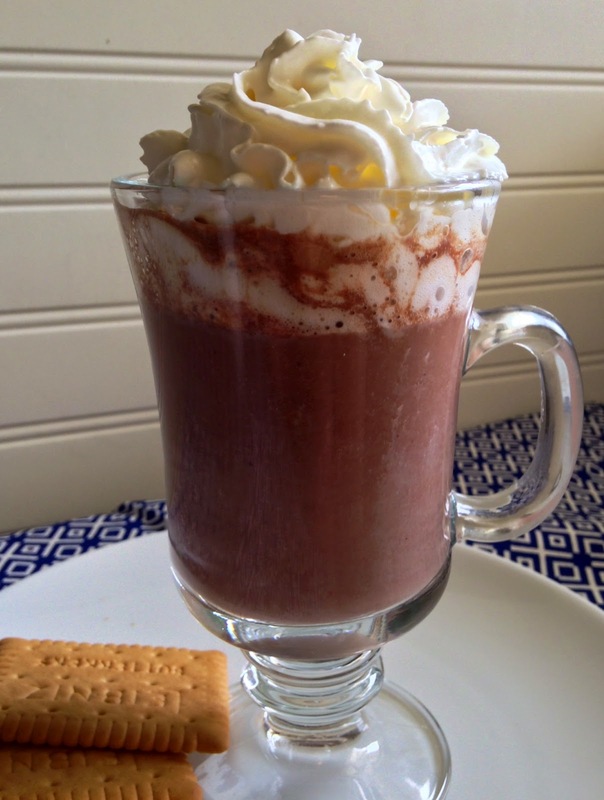 Treat yourself to this hot chocolate this weekend. Pile it high with whipped cream and curl up and enjoy it! In a small saucepan, combine the cocoa, sugar and 1/4 cup milk. Heat over medium-high heat, whisking frequently until the mixture is bubbly. Meanwhile, combine the remaining milk and cornstarch and stir well. When the chocolate mixture is bubbly, add the remaining milk mixture and salt. Continue to heat, whisking, until the mixture is boiling and thick. Remove from heat and let sit to cool for about 5 minutes before pouring in a mug and topping with whipped cream.